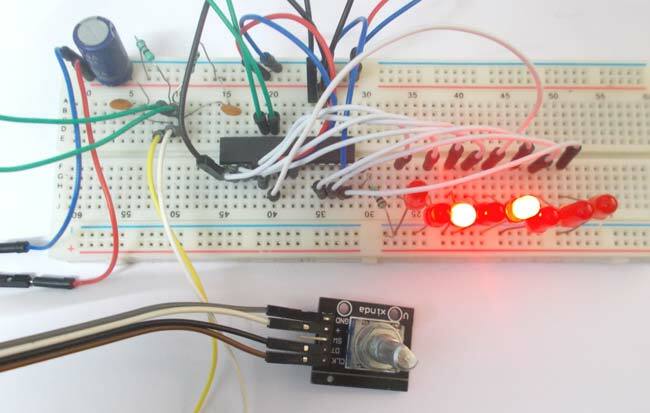 In this tutorial we are going to interface a rotary encoder with ATmega8 microcontroller. ATmega8 is atmel's microcontroller series designed for embedded applications. Rotary encoder is used to know the position of movement and angular movement of a motor or axis. It’s a three terminal device usually, with power and ground pin counts to five. A rotary encoder module is shown below. Clock pin or common pin. The ENCODER provides pulses representing the change in the shaft position for the systems to understand. Consider a ROTATORY ENCODER is powered up and the shaft is moved. Hardware: ATMEGA8, connecting pins, AVR-ISP PROGRAMMER, 220Ω resistor, LED (eight pieces), 1KΩ resistor, 220Ω resistor (2pieces), 100nF capacitor (2 pieces ), bread board. The capacitors here are for neutralizing the contact bouncing effect in ENCODER. Without those capacitors there will be some serious problems in position reading. When the shaft is moved there will be time difference between two output pins output. The ATMEGA8 will recognize this time difference for clockwise of Anti clock wise rotation. If the rotation is clockwise the binary count is incremented by one, and this count is shown in LED port as shown in figure. If the rotation is Anti clock wise the binary count is decremented by one and the binary count is shown at LED byte. Remember here we are not setting any fuse bits of atmega8, So the controller will be working on 1Mhz default internal crystal. Working of interfacing rotary encoder with ATmega8 microcontroller is explained in below code.